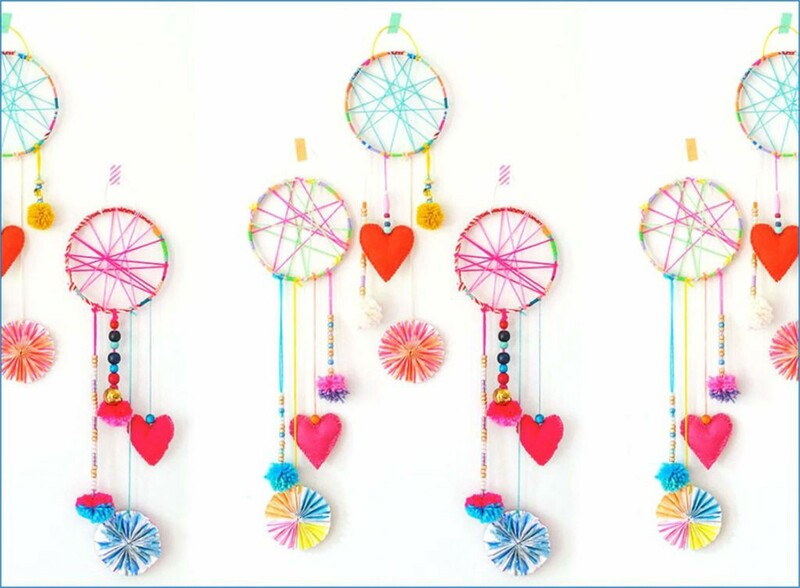 We are big fans of craft sensation Artbar and were recently stopped in our insta-tracks by their gorgeous dreamcatcher creations. We are big fans of craft sensation Artbar and were recently stopped in our insta-tracks by their gorgeous dreamcatcher creations. But when we read the instructions, we quickly realized this one was above our craft level. No big, who needs to sew their own felt hearts when Amazon sells them for $1 each (not us but #YouDoYou). Ditto on DIY yarn balls. If you’re super crafty, follow their instructions. If you prefer the fail-proof version, follow ours below. Loosen the hoop and remove the smooth inner circle. This is your “canvas”. Wrap the hoop in various colors of washi tape (the smoother it is, the more polished the final product). Cut 2 very long pieces of yarn (the same length) in the color(s) of your choice. Put the ends together and tape them to the hoop. Take one of the pieces of yarn and start tightly wrapping it around the opposite side, moving your way around the hoop. Either tie off or tape the end to the hoop when finished. Repeat with other piece of yarn. Cut 4–6 pieces of yarn (double each so it can hold the beads, etc) at different sizes, ranging from 6–12 inches, so the object on the bottom of each string has room to lie flat. Choose 1 or 2 of the shorter yarn strands and tie a knot around the bottom stem of the feather (if you opted to use feathers). Now thread a large needle to the other end and string beads as you like. When done, remove needle and set aside. Take remaining strings and knot the bottom, thread needle through top, and string heart or pom pom first, so it’s at the bottom. Then string beads as you like on top. Once all strings are complete, lay them out and decide the best arrangement. Then knot each one around the bottom of the hoop. Attach a small color wire to the top for hanging. Originally published at news.rocketsofawesome.com on April 11, 2017.